The Monticello home of former U.S. President Thomas Jefferson near Charlottesville. Looks like President Barack Obama isn't the only president who's known for his hospitality. America's third president, Thomas Jefferson, was too. And now Jefferson's Monticello is following up on that tradition by opening its doors to private parties. 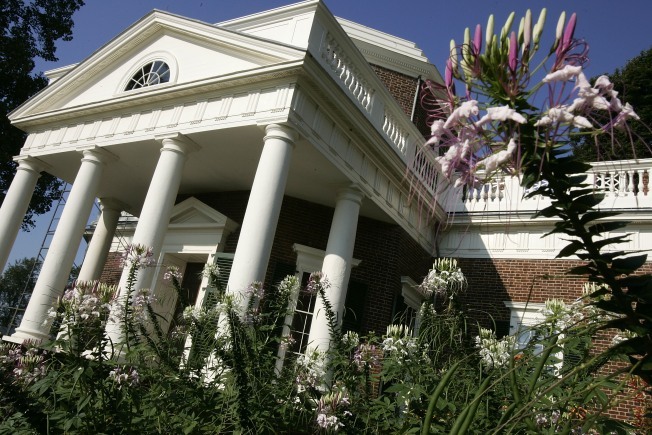 Jefferson's house itself is off limits, but corporations and other organizations can rent out the Jefferson library, the theater and classrooms in the Thomas Jefferson Visitor and Smith Education Center, the Smith Woodland Pavilion and outdoor spots scattered across the estate’s 2,400 acres, the CharlottesvilleDaily Progress reports. “It’s kind of in the Jeffersonian tradition. Thomas Jefferson was known for his hospitality at Monticello and at the White House,” Ann H. Taylor, executive vice president of the Thomas Jefferson Foundation, which owns and operates Monticello, told the Daily Progress. It turns out Jefferson was "the only President to give dinners extensively" and, "when Congress was out of session, Jefferson invited members of the local community to share his hospitality," according to the Thomas Jefferson Encyclopedia. Who knew? Taylor wouldn't say how much Monticello is charging to host special events. And it turns out Monticello is not booking weddings or wedding receptions either. "I don’t think we should rule out weddings in the future,” Taylor said.